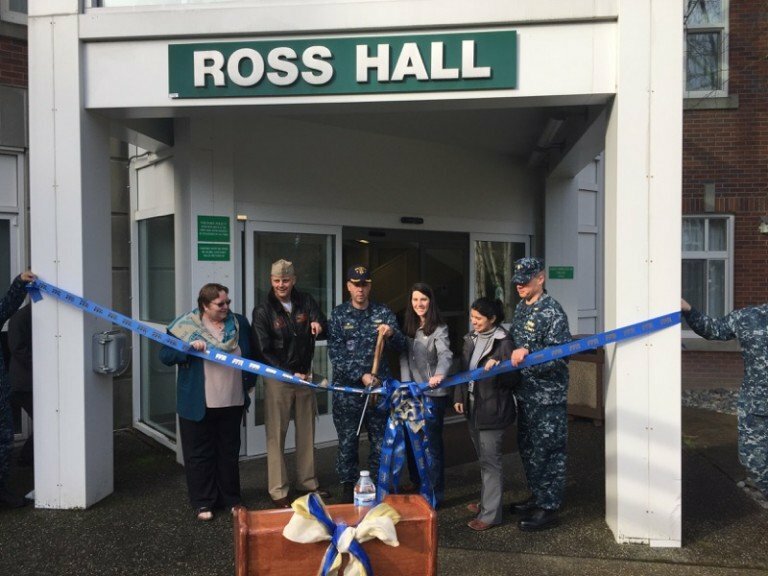 WA Patriot was proud to attend the ribbon cutting ceremony for the recently completed Unaccompanied Housing project at Naval Base Kitsap (NBK) in Bremerton, WA. The $13.8M project began in September 2012 and involved the installation of ground source heat pumps which will provide energy efficient heating and cooling to UAH 1001 and 1004, along with renovations and improvements to UAH 1001 to bring the facility up to current building code and barracks standards. WA Patriot would like to commend all who contributed to the success of this two year long project. It was an exceptional team effort by all involved. This project presented several unique challenges, which were overcome by the team’s ability to work together toward common goals in a partnership atmosphere. The WA Patriot team was lead by Rory Godinez and included Zerah Florance (shown in photo-third from the right), Erik Bjorn, Troy McLaughlin, Neil Colombini, Greg Gran, and Mark Zygmontowicz. The key contributing subcontractors included Notkin Engineering, BOE architects, AHBL, Abossein Engineering Neurdorfer Engineers, Geo Loop Tech, Stirrett Johnsen, Blue Mountain Electric, Spectra, Smith Fire Sytems, Sessler, and Glass Works.